It was an ambitious plan for a conference. 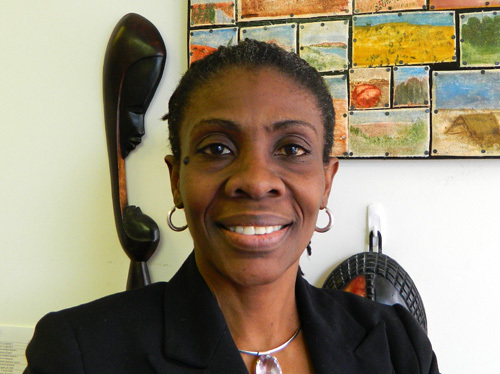 Languages and literatures professor Dorothy Odartey-Wellington, who studies Afro-Hispanic literature, wanted to host an event that would open up the dialogue among writers, storytellers and academics from various countries who share an interest in this heritage. “New avenues of research open up by encouraging dialogue,” she says. In addition to the writers and storytellers from Equatorial Guinea where Spanish remains the official language, Odartey-Wellington points out that there are people from other African countries, such as the Saharawi Arab Democratic Republic, Morocco and Cameroon who write or perform in Spanish. Additionally, there is growing interest in African and African-descendent literatures and cultures in Spain and South America. Bringing together people from four continents for a conference would not have been feasible. “Many of the people who would like to attend this kind of conference were faculty or graduate students without funding for travel expenses,” says Odartey-Wellington. Her solution: an entirely virtual conference. “I took my idea to the Centre for Open Learning and Educational Support, and they didn’t laugh,” she says. Not only did they not laugh, but Kyle Mackie, manager, teaching and learning technologies, says they were pleased to work with her to find a technological solution to her challenge. “This was the first entirely virtual conference we have done,” says Mackie. “But we were able to broadcast the proceedings to people in 12 different countries.” The event ran from March 5 to 8 and was funded by the School of Languages and Literatures and the Social Sciences and Humanities Research Council. The participants were from around the world, including Gabon, Ghana, Cameroon, Equatorial Guinea, Mexico, Colombia, Spain and the U.K. as well as Canada and the U.S.
To make it work, those who had agreed to present were assigned links to a service called Screenr, which allowed them to record their voices and whatever they had on screen: a PowerPoint presentation, a video or even a webcam recording them as they spoke. These were then captured by Screenr so that they’d be available when scheduled during the conference. Mackie and his team then used the Adobe Connect program to broadcast these recorded videos during the conference. People in the audience were able to “talk” with each other online using a chat option during the presentation, and once it was over, the presenters were available to answer questions orally. People could also send written questions and get a response. Participants were also welcomed by a live broadcast featuring Odartey-Wellington; Clive Thomson, director of the School of Languages and Literatures; and Don Bruce, dean, College of Arts, who spoke from a room in Day Hall. “Then, we flipped to the University of Ghana where the keynote address was done live,” says Mackie. Other plenary speakers also gave live presentations. After the conference, many of the participants told her about contacts they’d made, and the plans for future collaboration and research that grew out of their conference experiences. Odartey-Wellington hopes that technology might make it possible for students, especially in some parts of Africa, to take part in graduate-level courses or research projects in distant countries. “This has also helped to broaden the area of Afro-Hispanic studies to include other dimensions previously excluded, such as the Hispanic culture within the Saharawi Arab Democratic Republic, a former Spanish colony,” says Odartey-Wellington. “The phenomenon of writers and performers of African heritage who express themselves in Spanish even when their country is not Spanish-speaking is also important.” She added that there was also interest in including more work done by people of African descent in Latin American countries.